I've never had a fence, so Star has never been exposed to having things on the other side of one, or having a clearly defined, permanent boundary. He's started running up and down the fence barking at anything and everything, charging the fence, and really guarding the yard. The guy who does the yard, I didn't even know there was one, came the other day and said that Star wouldn't let him near the fence. Apparently the first time he had no trouble at all. I'm obviously going to put the dogs up for him, but I'm a little worried about people passing by. 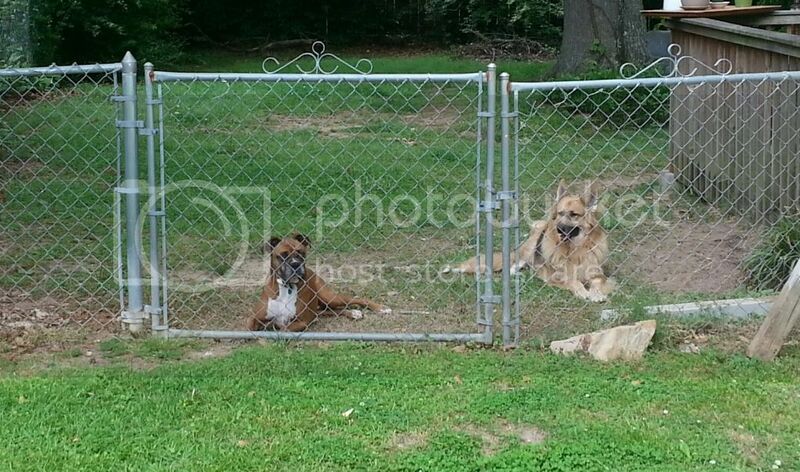 Is there a way to teach Star that the fence doesn't have to be that imposing force that he has to guard so much? Like Penelope, she will lie at the fence and recognize the difference between a threat and a passerby. Lucky and Boomer just chill in the sun. Not sure what to tell ya either. Personally, I'd rather have a dog gaurding my fence than to let everyone in. Although, on the flip-side, Shawn encounters dogs like Star daily in his job and actually got bit the other day by a dog guarding his yard. But, I put that blame on the owner....the dog should be put away when Shawn is coming over to do their lawn. (they do know he's coming over, tho, so a bit different than your last situation with Star) But, I don't actually mind mine guarding the fence line, that is their property and most likely, Star takes on that roll if the others are allowing him too. Well, I've never had a fence in my adult life or growing up, is it ok for a dog to be running up and down the fence and be acting like a crazy idiot? I thought he may have been extreme, but now that you've said something, maybe it is normal? I just don't want to be the person with the crazy annoying barking dog, I also have 4 dogs in the city where you're only supposed to have 3, so maybe I'm a little more cautious. Star barks at a leaf blowing on the other side of the fence. I would say that constantly running the fence is over the top, but unfortunately I don't have any experience with it. Is it getting better or worse? I know you've only been in the house a couple of weeks, so I wonder if the novelty will wear off? Are your neighbors getting barked at? I did call Dash in if he ever got "on a roll" with barking, but I let regular alert barking (even for "stupid" reasons) go. My neighbors had dogs and never complained, even when I occasionally apologized, so I suspect it annoys us more quickly than it annoys others. Because we are good dog owners who don't want our dogs to bother people. We have always had fences for our dogs, even as a child . Every one of our dogs would run the fence line and bark at people . Remy is way more protective of our yard then Edy . He will bark more and charge the fence if he does not know the person . Edy will bark but that is all . Both will run along the fence and sniff the fence line every time they go out . But they both will stop barking if I tell them to . I can call them (usually once for Edy & Remy twice ) and they will come up on the deck 99% of the time . It does not bother me if they bark a few times , I like to know if someone is coming into my yard . But I also like that I can make them stop if it becomes too much . What I did to stop the barking and get them to come was to call them while going out to them . Giving a treat to encourage them to come with me and let them see / smell the treats while going back to the deck and give another treat when we got on the deck. It did take a while but they got it . George is a maniac barking at the fence and we have a 6' wood privacy fence...and even digging under it to get to the neighbor's jack russell. I bring him in if he is carrying on for awhile or if I know someone needs to get access to our back yard. This all makes me feel a lot better. I think the main thing is that I don't want the neighbors to be annoyed by him barking, one neighbor seems to have the quietest dogs, and the other's dogs are with her parents. He's been pretty good about listening when I call him off, but I do have to bring him inside in order to stop him completely at that point. This is a picture of the welcoming committee. With the fence being that low you may want to make sure that they don't get to wound-up and try and go over. You can get the sun screen matiral to put up on the fence at home depot. May cut down on how much they can see. Abby can scale a 5' fence...well she used to be able to back in her younger days. LOL George's method is to go under the fence. Luna is a nut barking at everything behind the fence in the air or on the next block..I just call her in when she gets out of hand..Luna also tries to dig under the fence. Nala hardly barks but if she does i know to look outside.. I was worried about the possibility of them going over, or trying anyway, but they haven't so much as jumped on the fence, even with the neighbor leaning over it. They'd much rather stand there and bark, even when I get home and don't get out of the car immediately or if I'm unloading groceries or something, they still just bark and wiggle as opposed to jumping. I'm not sure what I'm able to do on top of the fence since I'm renting, I'll have to check with my landlord. Hanging the screen does not have to be perment. It can be hung as a temp thing. We hang the screens on the x-pens when we go to shows. Help cut down on how much the bark.